RIFT’s Public Test Shard (‘PTS’) was updated on the 23rd March 2015. Under 100mb update again. Nothing on the PTS that has visibly changed, but there’s some interesting datamining from this and past updates. 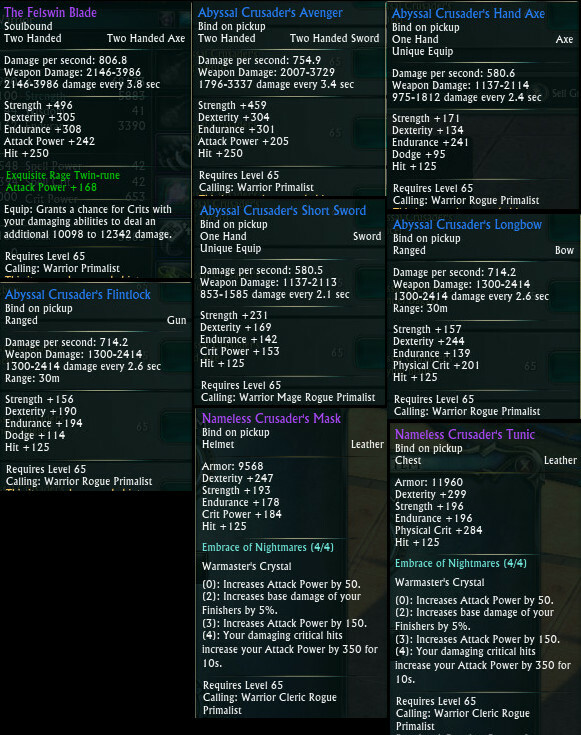 Interesting .GFX Files: Shapeshifter, Crossbows, Collection Binder, Melee/Ranged DPS role UI, ‘Treasure’ and Seasonal Loyalty. Although the design is similar to all the [Element]bound Steel bundles, there’s a distinctive lack of bare strips, and the elbow spikes don’t match up with the others. A new chest model, or something that already exists in the game? There was no name for each of these models, just generic “human_male_plate_torso”. A few .gfx files from past PTS updates have revealed some interesting names. Note though that anything below might not make it to Live, and some things might be old, scrapped concepts that won’t be making a return. We saw the Primalist in gear tooltips briefly before it was patched out in some March PTS update. The Shapeshifter class however was also present in some January files I looked through. Is the Shapeshifter the original name of the Primalist? Is it a future 6th Calling, or maybe just an abandoned/scrapped Calling? Could it turn into one of the soul’s for the Primalist? Obviously just the name mentioned in a file isn’t going to reveal much, but it’s something to keep in mind as we learn more about the 5th Calling slated for this year. Another item of interest. This time in the midst of a bunch of ‘Play Equipment UI’, there’s one for an “EQUIP_RANGED_CROSSBOW”. We don’t have crossbows in the game, right? Just bows and guns. Could this be something that Primalists are able to equip? Or perhaps, again, it’s just a scrapped type of gear. I’m guessing this is either referring to stuff like Mounts, Artifacts, Pets and Books (collections), or this could relate to the 3.2 wardrobe collections system. Perhaps the final release version of the collections system will have a book-like UI. A few roles also showed up. There’s the usual, but interestingly DPS is split between Ranged and Melee DPS. I doubt this would be a new selection for LFG, but perhaps this is for new UI icons for Build Presets to make it easier for new players to know whether a soul/spec is melee or ranged DPS. Perhaps there’s even an icon to signify that a preset build is good for pvp, thus the “ROLE_PVP”. “TREASURE”. No idea what it’s for. The rest of the objects surrounding it are various UI. “Seasonal_loyalty_sphere”. It’s something that we kind of saw with the Fae Yule Gift of Giving back in 2013 before it was scrapped. It was also mentioned in Trion’s GDC presentation back in 2014. As such, this could just be a scrapped part of the game. Above was a mock-up of part of the loyalty tier system that Trion were floating around prior to F2P. There were limited-time seasonal loyalty tiers that were probably supposed to pop up during each season with their own rewards. Again, this could just be something that’s scrapped but still exists in the files. A few interesting files and a chest model. The last few PTS Updates have been rather small – most likely mainly concentrating on changes to the Tier 2 Intrepid: Hammerknell Fortress raid. As we draw closer to 3.2 release, we’ll probably see a lot more of the ‘bulkier’, easier-to-access changes hit the PTS – stuff like the new wardrobe system, IA revamps and HK IAs. Sounds like it, although the Cleric Druid is just a pet class. Seems like the perfect opportunity for Primalist to have a proper shapeshifter-style soul. They could even link it up to the Plane of Life if Trion are going for a planar-style class.